When we first tossed around the idea of an “origins” piece amongst the staff here at Operation Rainfall, I knew I would need some time to decide what title had the single biggest impact on my gaming life. Over the past few decades, many games have had an influence on me. My very first experience with gaming involved Super Mario Bros. on the NES at the tender age of four, when I would avoid pooltime, lunch, the park, and my family for the entire trip all because I was plastered in front of their TV. The first time I saw The Legend of Zelda, I watched in awe as my cousins navigated the perilous mountains and caverns of what we now know as Hyrule. In kindergarten, I would waste entire afternoons playing MegaMan II, Kid Icarus, and Teenage Mutant Ninja Turtles at a friend’s house. My parents probably had good reason for not buying an NES. I could ramble on about my first Atari 2600 that was given to me by my Aunt and how the SNES was the first console I ever purchased on my own (along with my TV, which I bought for $5 at a garage sale). But despite how much fun I had playing video games up until that point, it was all just fun. Despite the countless hours poured into the hobby, I had never been emotionally involved in a game. It was all just for fun. The Legend of Zelda: A Link to the Past was the first game that pulled me into its world, and it definitely had a huge impact on my enjoyment of games. But if I had to choose one game that had me absorbed with its world, story, music, and visuals – the complete package – it would be Final Fantasy Adventure. Blurry Photographic Evidence. And yes, I needed four AA batteries. Forget for a moment that Final Fantasy is a franchise, because at the time, I had never played any of the previous “Final Fantasy” games. Also, pretend that you have never heard of Secret of Mana, (or Seiken Densetsu 2 as it is known in Japan), the sequel to Final Fantasy Adventure (to add to the confusion, it is also known as Mystic Quest in Europe). Forget that the game isn’t a Final Fantasy game at all, that it is actually the first game in what we now call the Mana series. And please, for the love of all things that are sacred, please forget the less-than stellar remake, Sword of Mana, for the Game Boy Advance. During the age before the internet, all I knew was that this was my first Final Fantasy game, and it felt a lot like Zelda, but with more danger, a more vivid world, and a heart-wrenching story, despite being on a big, white brick with purple buttons and a small green monochromatic screen. Before I get started on few key moments that truly made this game stand a cut above the rest, I want to expound on a feature that I wish would make a comeback, but is impossible due largely to big budget voice acting – the ability to name your main characters. I know that our own Jonathan Higgins has touched on this point in several articles, and felt the need to say it again, largely because having my own name attached to the main character gave me the illusion that I was the main character. Not to mention the emotional impact of naming the leading lady after my real life love interest at the time. Although limited to just four-characters/symbols, in my mind I was reading our full names in every sentence, further adding to the weight of the story I was about to experience. Immediately when the game is first powered on, a gripping, emotional tune begins to play. The slightly half-melancholy, half-hopeful melody tune sets the pace for the grand adventure ahead. Before you even leave the title screen, the haunting introductory music has already done more than a fair amount of foreshadowing. A brief synopsis follows the title screen, weaving a tale of the mystical Mana Tree, growing high above the clouds. The legends say that whoever touches the tree will be granted eternal power. As with many such stories, an evil man, going by the title of Dark Lord, sets forth to take this power for himself, with the intention to conquer the world. Right from the start, it is obvious that there is a far more mature story to this game than most candy-coated games of the time. Your very first segment of gameplay is in the gladiatorial arena, where servants are forced to fight for the pleasure of Dark Lord. By throwing you into the heat of battle without warning, facing a monster that is literally four times the size of your character, you get an instant sense of immersion, and then the realization hits that this adventure will be unlike any other. Just moments after your victory, you witness the death of your best friend, Willy, another casualty of Dark Lord’s twisted arena games. In his final moments, Willy discloses that the Mana tree is in grave danger, and that you must make your escape to warn the fabled Gemma Knights. Willy’s mysterious last words leave more questions than answers, and the only one who can provide these answers is a man named Bogard, who lives behind the falls. Your friend Amanda talks of leaving the arena to return home and see her little brother, but with monsters blocking the exit, she can’t find it within herself to make the escape. With vengeance in mind, you make your daring escape from Dark Lord’s castle, alone. But not before one final encounter with another beast in the arena! If you are victorious in battle, you make your way out of Dark Lord’s fortress, climbing down the castle walls. Your escape leads you to a wooded glen where you see Dark Lord and his loyal sorcerer, Julius, conversing about a girl who has the key to climbing the falls and reaching the legendary Mana Tree. After sending Julius to find the mysterious girl, Dark Lord catches sight of you and proceeds to chase after you to your presumed death off the edge of a waterfall. AND ALL OF THAT HAPPENS IN THE FIRST FIVE MINUTES OF THE GAME. Unlike many adventure games and RPGs of the past, this was merely the introduction to a glorious journey taking you through forests and across wide, open plains, deep into mines and caverns and across a vast ocean, riding into peaceful towns on your noble Chocobo, saving the girl of your dreams and meeting the last of the legendary Gemma Knights. Trust and betrayal, life and death, war and peace, love and lust, greed and humilty – these are just a few of the themes that are explored during the course of your lengthy quest. As the first game in the Seiken Densetsu (Mana) series, modern gamers will notice that it feels like a bare-bones version of the battle system found in the better-known Secret of Mana. Although the rings element is not part of the game, it does feature a live battle system, closer to The Legend of Zelda than anything in the Final Fantasy series. You see all enemies on the screen, and can choose to approach or ignore all of them. Defeating enemies earns EXP, which levels up your character. When your character levels up, players must decide what strengths they wish to level up Stamina, Power, Wisdom, or Will. You can choose to level evenly as the game progresses or choose to overpower any of those stats if you wish. Defeating enemies also ends with treasure drops that earn you money or new equipment. You will also gain the ability to cast spells. The most notable feature of the battle system is the power gauge, which, when filled, allows you to perform a special attack, doing massive damage to multiple enemies on the same screen for a short period of time. Eventually, partner characters will join you, adding an extra layer of strategy, since you can ask them to perform specific actions at certain times to assist you. 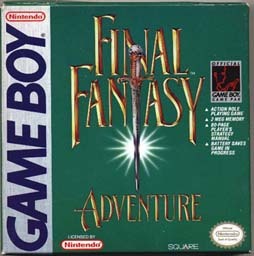 Final Fantasy Adventure perfectly blended the action/adventure elements of the Legend of Zelda with the RPG elements of the Final Fantasy series to create a unique “action/rpg” hybrid. The music is simply incredible from start to finish, and is a masterpiece of sound on the original Game Boy hardware. The graphics, although considered crude by modern standards, still manage to convey a startling sense of depth. Ripples on the surface of lakes and streams, forests are filled with trees, deserts appear windswept and dry, mines are filled with crystals and ore, waves crash on the coastline, and all of this is accomplished on a monochromatic 8-bit handheld. While more modern games tend to rely heavily on candy-coated graphics and full motion video sequences filled with scripted voice acting, older games required an active imagination. This might be a piece for another time, but in my opinion, the comparison of adventures and RPGs of yore to modern games is close to that of comparing a good book to its movie version. Final Fantasy Adventure is like a well-crafted book, painting vivid imaginary pictures in the head of a younger version of myself, crafting an exciting adventure with a few pixels and roughly translated text, although the included 80-page instruction manual packed with concept art and separate full-size paper map of the gameworld definitely helped flesh out the package. This map and an 80-page Instruction Manual filled with concept art were included with every copy of the game. Sorry I can’t get a bigger picture. I was originally going to spoil the final boss and ending in this piece because the ending of the game is both an emotional high and low, and is arguably one of the strongest plot devices in any game to date. The ending to Final Fantasy Adventure is the one thing that pulled me into the larger world of RPGs, which eventually led me to being a co-founder of Operation Rainfall. The ending to this game makes me appreciate the intricacies of modern classics such as Xenoblade Chronicles and The Last Story. The same style conclusion may have been reused by other titles over the years, evolving graphically or advancing with technology, but since this is the original and I was much younger then, it had a much more profound impact on me. Rather than spoil the ending for everyone here, I am simply going to recommend finding a way to play the game, naming your lead characters after yourself and your real-life love interest, and experiencing this incredible adventure for yourself. Previous Post:RUMOR: Skies of Arcadia HD Coming Soon? Next Post:Mutant Mudds “Grannie Levels” are Coming to the eShop—Free!